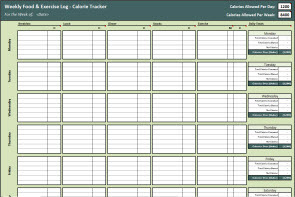 Use our FREE Calorie Tracker Spreadsheet to document all food consumed and time spent exercising. This diet and exercise log tracks calories against your daily caloric goal. If you consume more calories than your goal, the log will highlight overages. Documenting the food you eat helps keep you on track and aids in weight loss. Use this spreadsheet in conjunction with our Weight Loss Tracker for a complete diet solution.